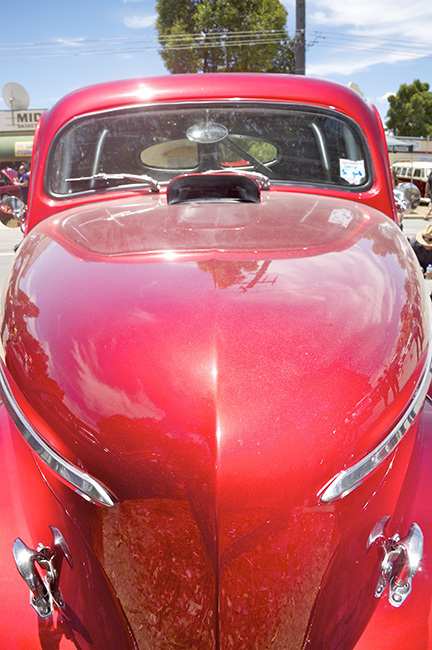 When you are planning your next car show, could you please park them a little further apart? 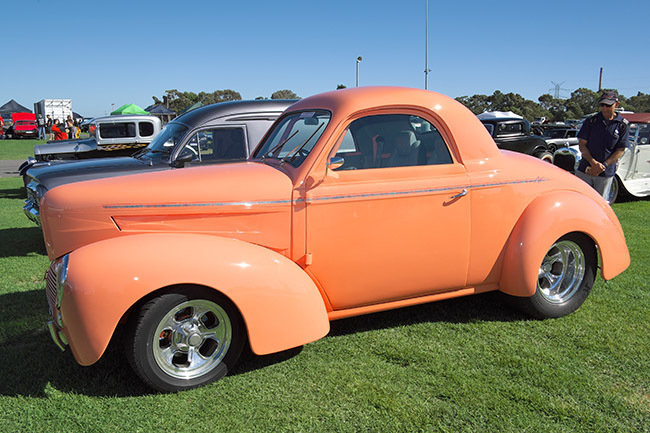 We are thrilled to bits that you will be bringing your vintage-veteran-hot rod-street car-sports car-truck-bus-tank to the park-stadium-exhibition hall-mudflat behind the asbestos works. We don’t mind paying at the door-gate-edge of the car park for the privilege of seeing your prize machines and we want to make great pictures of them. We promise not to stand on the running boards like the punters do, and poke the dashboards like the punters do, and scratch the duco like the punters do. We will be respectful. We will be utterly patient as the tag-teams of lurching punters slowly walk in front of the cars and progressively block the view…never allowing a clear sight of the edges of the cars. We are trained to stand still in one spot until the exact quarter of a second when the mob clears. We are frequently consulted by still hunters and snipers about how to remain motionless. Ninjas envy us. But we need a helping hand. If the cars are parked too close together we won’t be able to do them justice. We’ll have to use extremely short focal length lenses and the cars will look distorted as hell. Of course if they are Italian supercars no-one will be able to tell, but the regular British and French sedans will look odd and it will be a dead giveaway. Likewise, if you park them with their back to the sun, most of the exposures will look too dark – we’ll end up trying to light the front of the car with a reflector or a fill flash and it will look most unnatural. Again the Flopatelli Snazolla III Supraeformaggio won’t suffer too badly, unless it is the open Monza version with the folding wings. And they look bad in ANY light. We do appreciate the trust and kindness the drivers show by leaving the passenger’s side window down – the interior shots will be so much better – but if you can’t manage that, it’ll be all right anyway. We can boost the shutter speed to 1/180 second, stop down to f:16, and fire a fill flash up at the headliner from the quarter window position while the camera looks in through the side. It’ll be a little dirty but not too bad. If you leave empty beer cans and dirty novels on the front seat that is your affair. In exchange for these small changes we promise to take good pictures of the way your cars look. We will photoshop out the rust holes – unless you are driving a rat rod, in which case we will photoshop more in for free. We will draw a discreet curtain over the state of the interior floor. Gillam Drive show last year. A must-see show here in WA, and all for free. 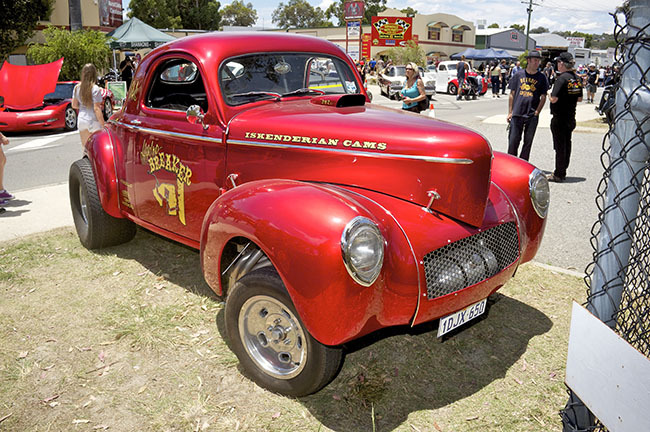 For free if you don’t buy a tee shirt or a choc milk at the lunch bar or go book your car into one of the panel beaters or chop shops on the Drive for a complete custom job…One day…Note to attendees – it is always a hot day out on the Drive. Hat and sunscreen and thongs. There are bits of metal on the ground. This car makes me suspicious. I think it has been modified to go faster than the speed limit. If I were the police I would lurk in the bushes and jump out at the driver. If I were the driver I would lurk in the bushes and jump out at the police. Well, at least someone would get the jump on somebody. 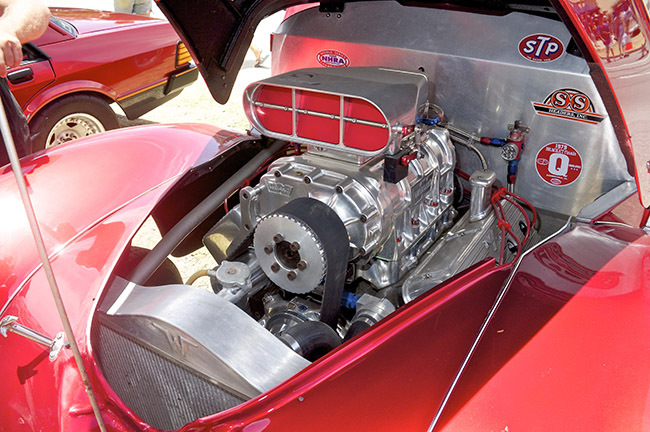 Thinking about it – hot rodding in all its various facets is getting to be quite a link with the past – for a number of generations and nations. 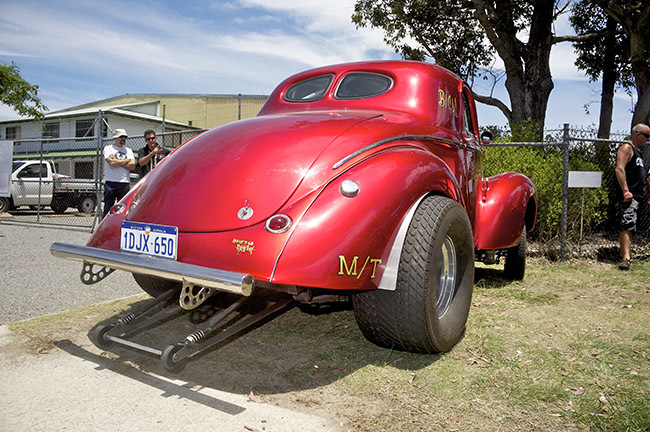 We’re always glad to see the American cars here and to work with them to make great vehicles – I do hope some of the Australian cars of the past get a chance to go and rod in the USA and Canada. And wouldn’t it be nice to see the Europeans embrace the aesthetic with some of their own native marques. They can’t all be sports car enthusiasts – or builders of amateur farm machinery like in the DDR. Well, there are no prizes for guessing which car was my favourite on Sunday. The colour of it called all the way across the car park promising something exotic. When I got closer I was not disappointed. 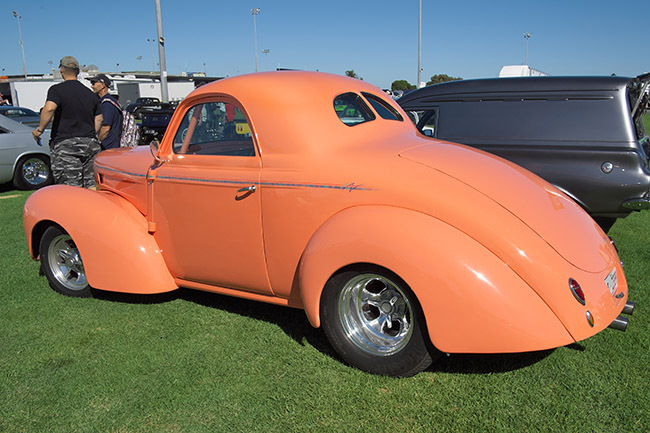 It is a Willys Business coupe – I suspect a 1940 model. I also suspect that it was not an original import to Australia, but has been brought in from the States and converted to RHD. perhaps I am wrong and the owner can correct me. – it has the look of a 1990’s rod. Well, where to start…the long rear deck and boot lid compared to the bonnet length is characteristic of a business coupe. I guess they were intended as prestige salesman’s cars with a great deal of space in the back to haul samples and advertising material. Away from work, that increased boot space would be a killer feature for touring. No luggage restrictions for this traveller – you could fit a couch and a piano back there. 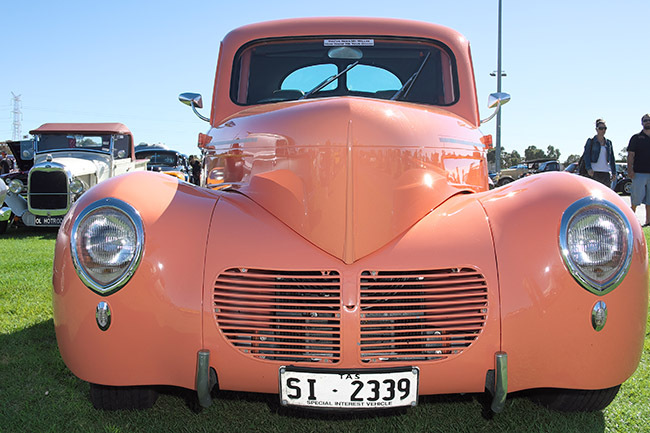 The smooth styling of the ’40 is more than half-way there to a great custom anyway, but the stylist has wisely made the most of the bonnet sides for cooling vents. 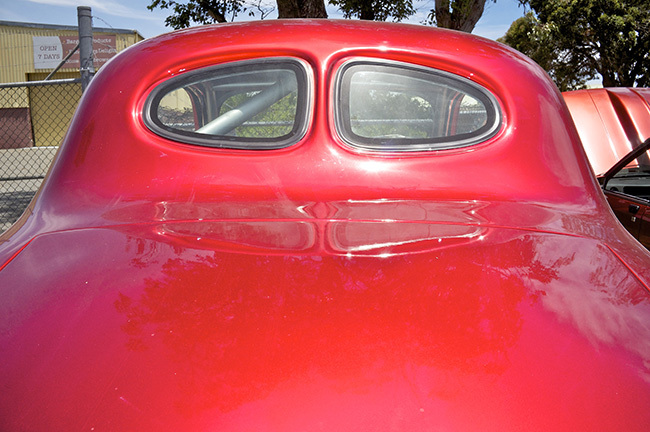 The bonnet looks longer than it is, and the front fenders look more massive than they are – it is the triumph of art deco streamline design. This is a car that would look well with a Dreyfus or Loewy locomotive or a Lockheed air racer. What an amazing design from the people who made the jeep! 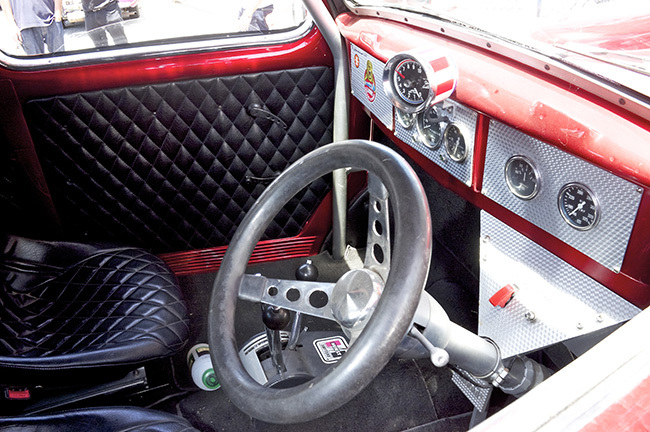 I have not been able to Google up a good picture of the interior of a stock ’40 Willys so I cannot tell you how much of the current fit-out is an adaptation of what was there or is an entirely new departure in style. 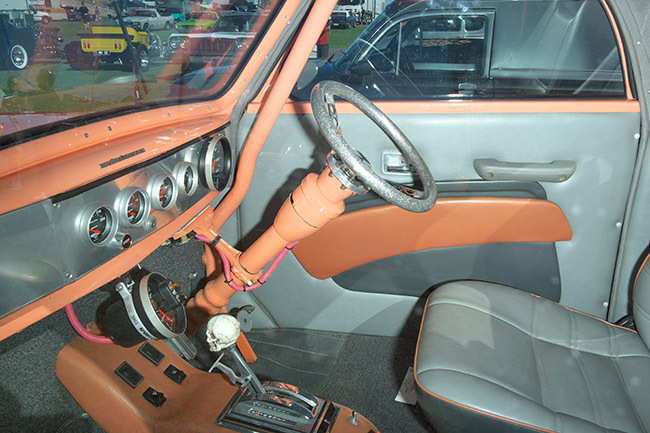 I’m pretty sure that is a cut off connecting rod holding the steering column but I am puzzled at what appears to be a pink roll cage at the side of the door. The door padding and upholstery looked pretty exotic as far as design. The paint is not pink, but a light salmon. There is a sparkly accent strip down the side with a few Z’s to finish it. 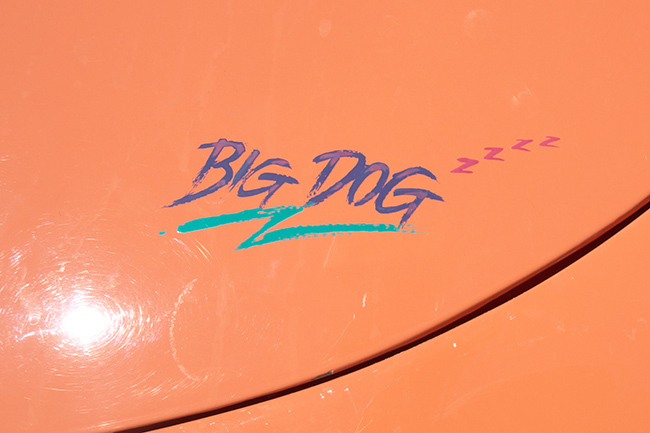 And there is “Big Dog”. I should be grateful if someone would tell me the origin of the name. * Note for overseas readers: the Tasmanian license plates are becoming more common here in Western Australia since they finished the Bass Strait Bridge. It’s been a boon to the campervan tourist trade the other way as well – flocks of Asians drive over from Victoria to see the Tasmanian tigers and local inhabitants.